When AzhwAr was asked “Does that mean that no one can know about emperumAn and see him?”, he responds saying “he can be seen through the method that I am going to say”. He says in this pAsuram that it is very difficult to know him. aRivu ennum thAL koLuvi – ensuring that the mind does not stray into matters other than emperumAn by bolting firmly with the latch of knowledge. Leading it (mind) instead towards firm knowledge on emperumAn. aimpulanaum thammil seRivu ennum thiN kadhavam semmi – keeping the sensory perceptions from straying into worldly matters and ensuring that they stay in their respective position by locking them up within the strong door. Ensuring that they do not go out by locking the door – the firm door in which mind and sensory perceptions are linked together. This refers to how the sensory organs are controlled. maRai enRum nangOdhi – constantly reciting the vEdhas which, by nature, do only good to others, and sustaining this way. Just as it is mentioned in SrI vishNu purANam 1-6-2 “yOgAth svAdhyAya mAmanEth” (through meditation, attaining learning), if one were able to practice meditation, the union of pramANam (authentic source of information, here it refers to vEdhas) and pramEyam (one who is indicated by the vEdhas, emperumAn) should be experienced. nangu uNarvAr kANbarE – those who follow this way will be able to see [emperumAn] always. Those who know well, follow these steps: SravaNam (hearing), mananam (thinking), nidhidhyAsanam (meditating), upAsanam (carrying out upAsanA or devotion), dhruvAnusmruthi (meditating continuously), dharSanasamAnakArathA (appearing like visualising directly) and prathyakshApaththi (seeing with the eyes) [in matter relating to emperumAn]. paingOdha vaNNan padi – characteristics of one who has the complexion of green coloured ocean; one who has the divine form which removes fatigue. Such people (who know, following the steps mentioned above) will see every day. Just as it is mentioned of nithyasUris (permanent dwellers of SrIvaikuNtam) in rig ashtakam 1-2-7 “sadhA paSyanthi sUraya:” (nithyasUris see emperumAn constantly), these people will also be able to see all the time. 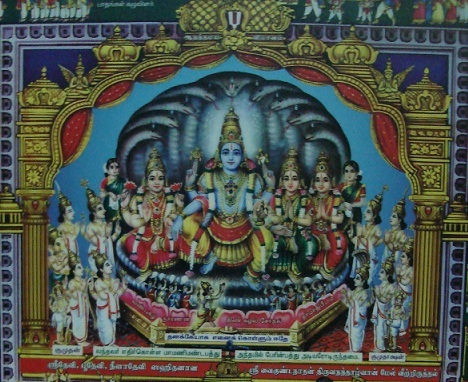 nangOdhi nangu uNarvAr – Just as it is mentioned in harivamSam bavishya 89-9 “OmithyEva sadhA viprA: patathadhyAdha kESavam” (Oh brAhmaNas! Always recite Om. meditate on kESava), reciting constantly. nangu uNarvAr – those who recite in the proper way. We shall take up the 13th pAsuram next. This entry was posted in iyaRpA, mUnRAm thiruvandhAdhi on March 7, 2018 by T N Krishnan.